Everyone wants to be happy. Whether it’s that lifelong happiness that comes with from great friendships and falling in love or a fragment of joy found in the briefest of moments, if you’ve ever wondered what life is all about, this is it. Happiness is what you need, guaranteed. On Friday, Carnivorous Fiancé and I had a rare couple of hours together before leaving for work. In between the office, writing this blog and our various other hobbies and routines, it’s not often we see each other for more than a few minutes in the morning. We made breakfast side by side, spent time talking over muesli, fruit and eggs, cranked the stereo up loud and jived around the room to the tune that will be the first dance at our wedding. I dipped these ice cream bars in chocolate (we had friends for dinner that evening), we jived some more and Carnivorous Fiancé ended up having to change his shirt because I’d managed to smear it with sticky chocolate fingers. Happiness isn’t perfection, it’s finding joy in the simplest of things. Speaking of simplicity (and happiness), these ice creams are where it’s at. Made with a basic blend of peanut butter, sugar and cream, the ice cream takes only as long as your machine does to churn it. A few hours to freeze solid then the whole lot is cloaked in melted chocolate and studded with roasted peanuts for the ultimate in smooth, sweet, crunchy, creamy, salty, melting mouthfuls. Remember those fragments of joy I mentioned? A corner of one of these ice cream bars is definitely one such fragment. Incidentally, these ice creams are entirely gluten and egg free. I made them for a friend who is allergic to both and he described them the next day as ‘the best thing I’ve ever eaten off a stick’. Perhaps not the best thing he’s ever eaten ever, but lollipops, kebabs, candy floss and pretty much any kind of ice lolly or ice cream, beware. One note on egg-free ice creams (and any ice cream really): ingredients are key. Less powerful than their egg-enriched cousins, ice creams made of cream, milk and a single flavour rely heavily on good ingredients. Use natural peanut butter with no added sugar or salt, full fat cream and milk, quality vanilla and flaky fleur de sel if you can find it. 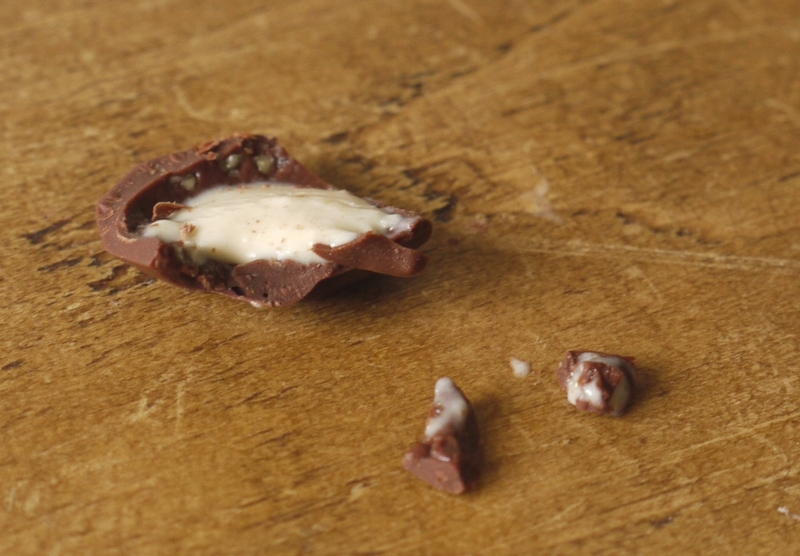 Likewise with the chocolate coating – there’s nothing to mask the flavour here so use your favourite brand. If you have time, salt and roast the peanuts yourself – it’s much easier to adjust the seasoning as you wish. If you don’t own the silicone moulds I used, you could freeze the ice cream as a block and cut into bars once solid, as I did with these homemade Snickers ice creams. Don’t worry if they don’t turn out completely perfect, they’ll still taste delicious and make you very, very happy. Sometimes it’s the small things. In a blender, combine the peanut butter, sugar, cream, milk, salt and vanilla extract until smooth. Chill the mixture thoroughly in the fridge, then churn in your ice cream maker according to manufacturer’s instructions. Transfer the ice cream into silicone bar moulds, inserting a wooden stick then smoothing the tops flat. Freeze until hard – overnight would be ideal. Line a tray that will fit in your freezer with baking parchment. Melt the chocolates and vegetable oil in a heatproof bowl suspended over a pan of simmering water. Remove from the heat and allow to cool for 5 – 10 minutes. 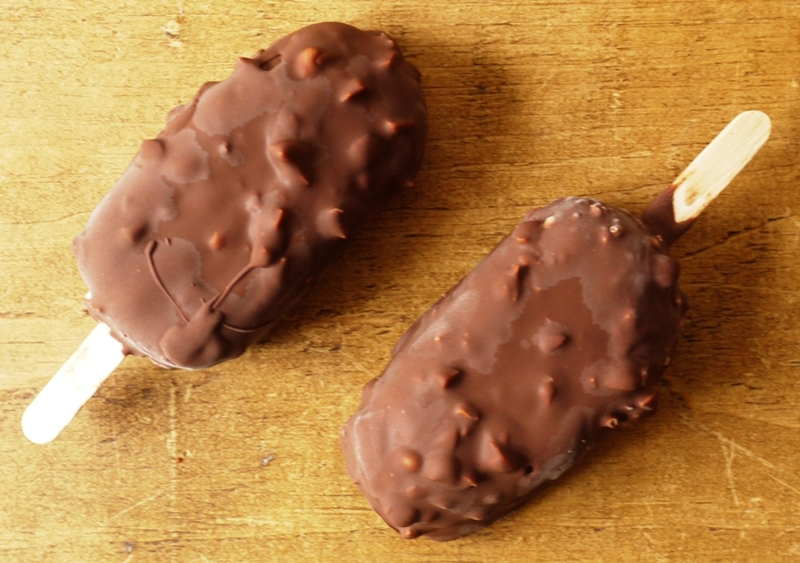 Remove the ice cream bars from their moulds. Stir the chopped peanuts into the chocolate then, one at a time, dip the ice cream bars into the mixture, using a spoon to ensure the sides are completely coated. Allow the excess chocolate to drip off then place on the prepared baking parchment. Return the ice cream bars to the freezer until ready to serve. I think these would definitely make me very happy! Such a simple but tasty combination. This is the kind of recipe that makes me very happy and i haven’t even eten it yet. When I do, I will be joyous. Agree with you over the good quality natural peanut butter, it is a world apart which makes these ice cream Magnums so irresistible! 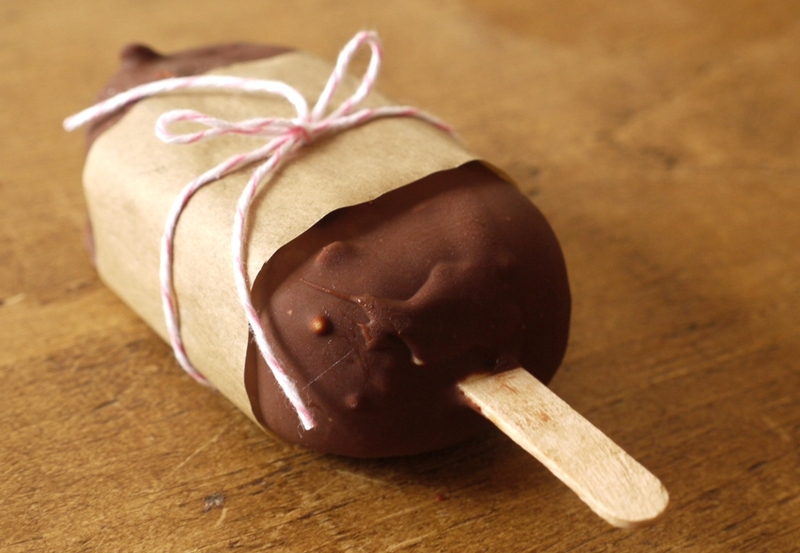 Nicky – I do love a good Magnum but they’re so much better when you make them yourself with proper ingredients. Kathryn – chocolate and peanut butter has been a bit of a theme recently! Frugal Feeding – ah, thank you. Laura – when I taste the processed stuff with added sugar now it’s far too sweet and synthetic for my tastes. I don’t know what I love more about reading your posts, the amazing recipes; the fabulous pictures, the great stories or, maybe just maybe, it’s learning another cool word or name for something we have differently named here in the states. Personally, I love the idea of these being called Magnums. So clever. Here they are boring ice cream sticks. Blahhhh. I love Magnums but these look even better! The ice cream recipe looks so easy that i might start making ice cream again. Oh wow wow wow! These look so impressive, but I love that their relatively simple. So delicious looking! These look totally fab and I could so eat one right now! Wow! I can almost taste these. Inspirational. Stephanie – the ice cream is so easy. If you don’t have a machine, just freeze it in a tub, taking out every 20 mins or so to fork through to prevent large crystals forming. Lorraine – it’s quite hard to get a thin layer on the homemade versions, but all my friends said they preferred the thicker chocolate anyway! Camilla – me too…there’s one left in my freezer that’s calling to me! Narf – haha, so pleased you like them. It’s practically the same recipe as the Snickers ones minus the caramel – both are delicious. Enjoy! Aww! The look so cute and tasty, especially with that thick, thick chocolate! I want, need have to have one of these. They look amazing! I love the thick chocolate coating. That’s my favourite bit! I just recently started seeing magnum ice cream bars on this side of the pond, say 2 years ago. 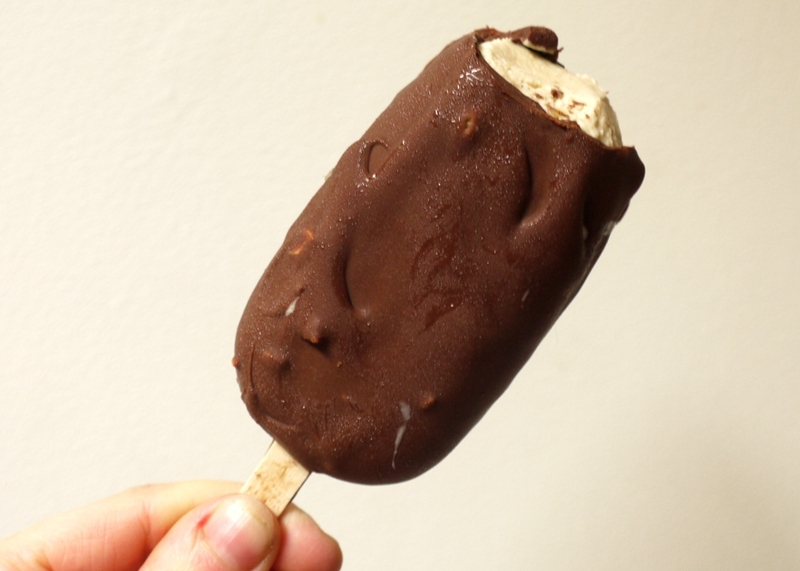 The most popular ice cream bar brands are Haagen-Dazs (decent) and Dove (not so decent). All I know is that these look fabulous! 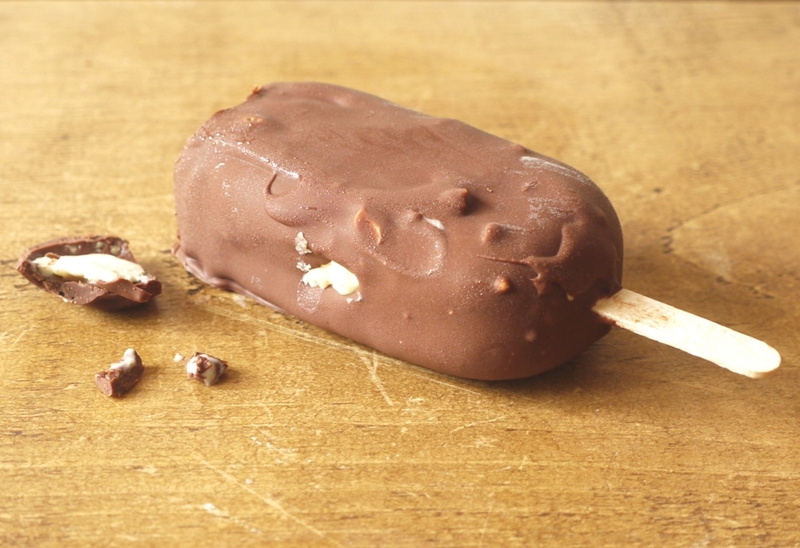 I love when an ice cream bar has nuts in the coating. You have a thing for chocolate-peanut butter, don’t you ;). I don’t have molds but would love to try the block version. Jennifer – that’s what a lot of people seem to be saying! 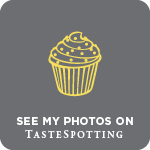 Nuts About Food – glad you like them! What a perfect and fun morning. My favourite magnums are the really dark ones with cocoa nibs in the chocolate. Yours look amazing, just amazing. OMG I’ve only just discovered your blog & this was the first post I clicked on. I think I love you…. I must have these, they look divine! Please would you tell me where you got your lolly moulds from. I live in Spain and can only get children’s lolly moulds.